There were two chances to see a Galilean moon entering or exiting Jupiter’s shadow from California tonight. At 6:22 PM Europa came out of the planet’s shadow, and at 8:50 Callisto went into it. I missed the first one but caught the second one. I cheated a little bit; in addition to observing the disappearance of the moon at under 20x as required by the rules, I also photographed it at higher magnification in my 6″ reflector. Now, when I first started observing, there were four little moons, two on each side of Jupiter, and as I watched, the inner one on the right got dimmer and then disappeared. But that requires a little unpacking. If you punch up Jupiter this evening in Stellarium or Celestia (follow the links on the right to download ’em if you haven’t already–they’re free), you’ll see that Callisto was the inner moon on the left as viewed from Earth. It was the inner moon on the right in the telescope because Newtonian reflectors rotate the image by 180 degrees. No big whoop, but if you watch the un-flipped version in Stellarium, the mechanics of the process are a lot clearer. If you face south to see Jupiter, the sun is off to your right, having just set. 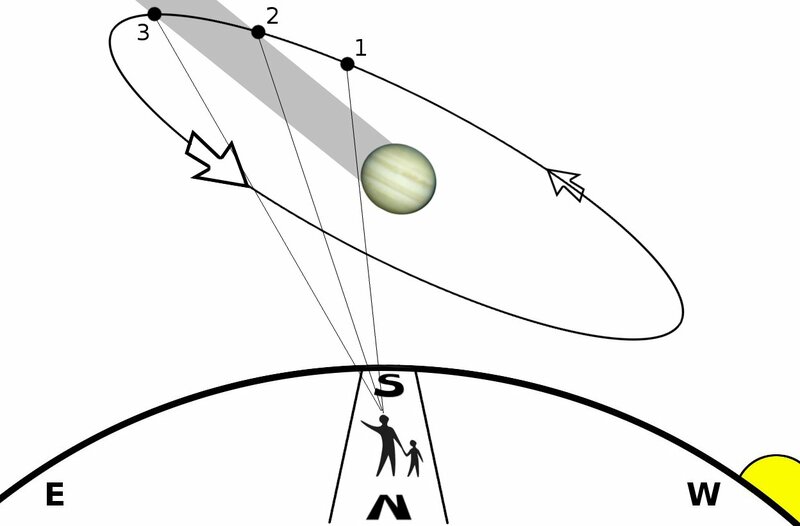 That means the shadow of Jupiter forms a cylinder sticking out into space to the left of the planet as viewed from Earth. 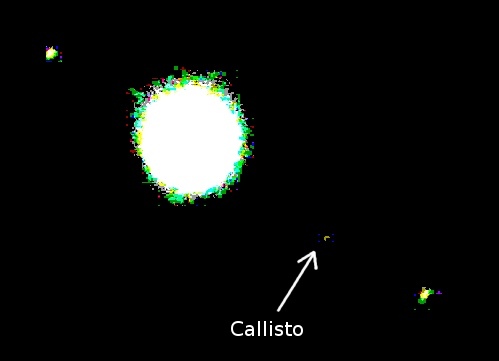 Since most stuff in the solar system orbits in a counter-clockwise direction* when viewed from above (Earthly north), Callisto must be on the far side of Jupiter from Earth. Callisto came out from behind the planet (1), was briefly visible from Earth, then entered the planet’s shadow (2), and will re-emerge in a little less than two hours (3). * Neptune’s largest moon, Triton, is a notable exception, and its backward motion indicates that it is almost certainly a captured Kuiper Belt object and not a “true” moon. In fact, it is possible that all of Neptune’s moons are captured objects. 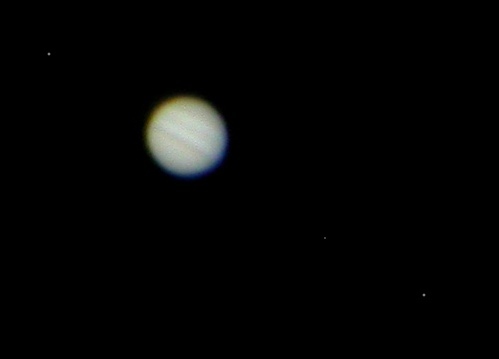 Jupiter looks lousy compared to previous efforts because I was looking through most of the LA light dome and attendant haze, but still: eat yer heart out, Galileo. One required task down, ten to go!